Still stuck to the Hybrid or native, Android or iOS, and React Native or Ionic question? Don't worry, we will help you in making the right decision with our expert insights on React Native vs. Ionic debate. Which framework is better for your app project and how you should make the right decision; you will find all the answers in this write-up. Let’s dive into the in-depth discussion to explore the pros and cons of both the platforms. What Are Hybrid and Native Apps? Before we start comparing React Native and Ionic, let us refresh our knowledge regarding Hybrid and Native apps. These mobile apps are built according to the OS guidelines using the language required. These apps are developed under the strict technical instructions and user experience guidelines in a mature ecosystem of the operating system. Since the app is built specifically for the OS, it runs faster, and user experience is just on the point. What I mean by ‘just on the point’ is that the app leverages its native nature to become accessible and smooth for the users. Besides, the app can also directly use the device’s features (GPS, address book, camera, etc.) and other OS offerings. In short, the native mobile apps are meant to be run on the respective platform that gives the best user experience. The reusability of codes makes it faster to develop and deliver apps using React Native. React Native is independent of the iOS, or Android platform, which means the codes can be used across platforms in react native. 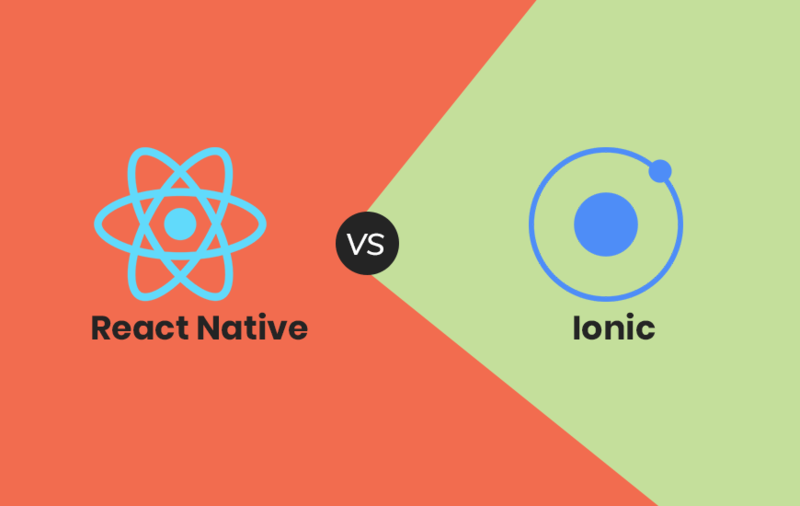 Now, you know about both Ionic and React Native, so it is time to dive into the comparison on the basis of different parameters. Talking about the technology both the React Native and Ionic frameworks based upon are entirely different approaches React native follows the “learn once and run everywhere” approach, where Ionic uses the web technologies for creating compelling apps. React Native works under the platform's guidelines and restrictions to achieve the feel and features of a native app. React Native use the UI native components to help the developers in providing a seamless experience to the user. On the Other hand, Ionic leverages the web technologies to built multi-platforms apps. Besides, the framework uses the minimum code base for app development and it is based on Angular to provide smoother and faster process. The developers with the knowledge of Angular finds Ionic more convenient and user-friendly. React native is the first choice of the developers looking to develop an app close to the native experience. However, React Native requires the developers to modify some of the platform-specific components to achieve the ideal results. Compared to Ionic, React Native is a more stable framework and suitable for a large-scale project. The framework works on the responsiveness and UI in detail that requires a higher budget. React Native does not follow the write once and use everywhere logic like Ionic. React Native will suggest the developers about the logic and components which is suitable for the targeted platform. For example, while working on Android, you will get a customizable toolbar, but iOS doesn't have that much flexibility in the toolbar. So, you need to find another toolbar in React Native, or you can also separate the platform-specific logic. React Native is based on React, which is here for a long time now, so the framework is supported by a vast community. Besides, the framework is also used by Facebook and Instagram which makes it more popular among the developers. React Native is backed up by an active community of the developers that make it is easy to find answers to your questions and get the bugs fixed in no time. Moreover, React Native also has a significant ground for the plugins you will find the plugins easily to React Native. Moreover, there is an NPM for the framework where you will find a number of relevant plugins. Along with this, there is also a plugin that provides access to PhoneGap/Cordova plugins that can be used to acquire many mature plugins belonging to the other communities. Ionic has been in the market for a while now, so there is a fair possibility that you find the plugin for a native feature you are looking for. Besides, the Ionic community also has a marketplace where people sell and buy the plugins. Code Reusability Code reusability is available to develop apps for Android, iOS, Windows Phone, Web, Desktop & Progressive Web Apps. Code can be reused to develop Android, iOS and Windows apps. React Native Vs. Ionic: Which one to choose? Directly coming to a conclusion and saying which one is better is not that simple. I honestly can't tell which one to use without knowing about the different factors that drive this decision in your case. The selection depends upon your project details, preference, time of the development, cost, and knowledge & skills of the assigned team. Comparing React Native and Ionic is like comparing the Xbox to PlayStation, which entirely depends upon your requirements. However, the best thing I can tell you is that if you are looking for low budget, and a high-performance app in a limited period of time then Ionic is the one. On the other hand, if you are dealing with a high budget app that requires more native-like experience then React Native will be the perfect choice for your project. If I talk about my personal opinion, I would like to go with React Native as the app needs to be fast and responsive. The native features in the app make it possible for the users to interact with the app seamlessly. How React Native Holds The Future of Hybrid App Development? Developing an app itself was pretty difficult once upon a time. But now, things have changed and we owe it to better app development platforms. We now also have more developers and developing companies skilled at developing apps that are more in tune with the current demands of the customer market.